Szechuan Noodle Bowl at 420 8th Ave South in Seattle, WA. I've mentioned Szechuan Noodle Bowl on my personal blog quite a few times, but it's still necessary for me to post a review here. This restaurant is one of those hole-in-the-wall places with only eight tables located in Seattle's International District. But, sometimes those types of places can be the best. Read on to see how I really feel about Szechuan Noodle Bowl. 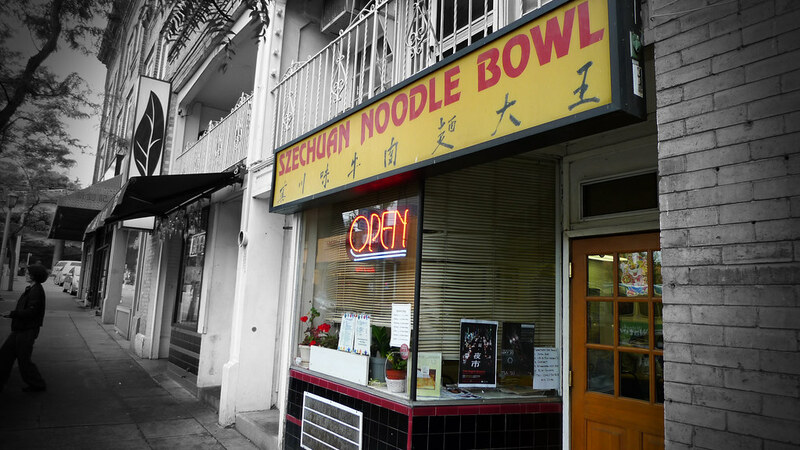 Compared to other noodle shops in Chinatown, Szechuan Noodle Bowl doesn't exactly stick out in terms of looks. The sign is old, the building looks decrepit, and the exterior is sort of dirty. However, inside you will find some of the most delicious food I have ever had in my entire life. I've been going to Noodle Bowl ever since I was a kid. I fondly remember riding King County Metro route 194 from Federal Way to the International District with my grandparents when I would visit in the summers. My grandfather would take me to Szechuan Noodle Bowl nearly every week for lunch. Now, I get to take my daughter to the Central Link light rail from Tukwila to the ID and share the same experience my grandfather and I had. 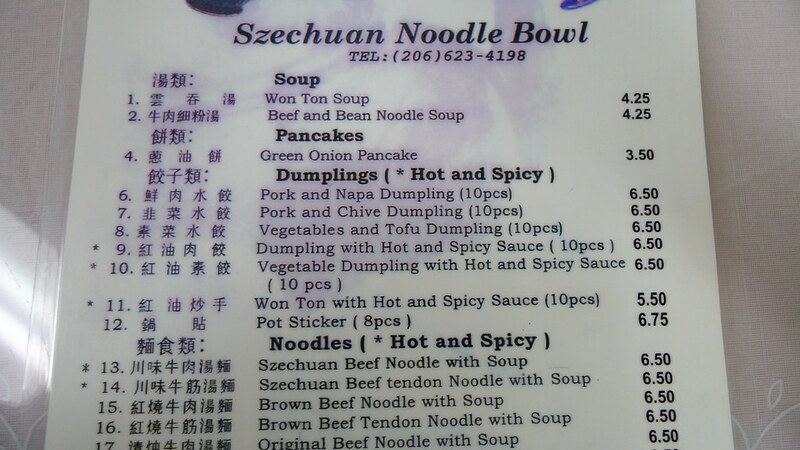 Part of the menu at Szechuan Noodle Bowl. Sorry I cut off the bottom and didn't take a shot of the items on the back. The inside of Szechuan Noodle Bowl reflects sort of the same view as the outside. Old with ugly pictures on the wall and a poster for the not-so-great Jackie Chan and Jet Li movie, The Forbidden Kingdom. It is a sit down and order restaurant and when they're not incredibly busy, a couple of the waitresses will put stuff on a table and you get to watch them make the food that they later refrigerate or freeze to serve for later in the week. But I challenge you to find an open table at this place around noon lunch time. There's never a line or anything, but it's best to go when they first open at 11:30 or after the lunch rush around 1 or 1:30. The selection of dishes is quite wide for a small place like Noodle Bowl. 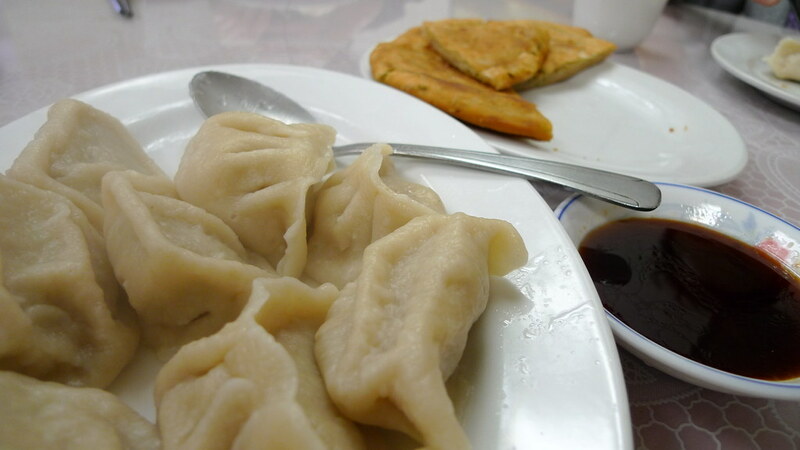 Along with their noodle dishes, they also have dumplings, vegetable dishes, and green onion pancake. Speaking of green onion pancake, they have the best. I'm not sure if they make it fresh there, or if they buy it fresh, but they cook it up and it is perfectly crunchy on the outside and soft and chewy on the inside. I'm drooling right now just thinking about them. I also order the pork and napa dumplings occasionally when I eat there and they are also delicious. You won't find much better dumplings in Seattle. Now those I know for sure they make fresh because you sometimes see the ladies making them in the corner. Pork and napa dumplings and green onion pancake. But let's get to the noodles! Their noodles are long, fresh, and thick. They are called cu mian and are similar to Japanese udon noodles, but better. I find that they absorb the broth much better than udon can and don't have that springy chew udon has. You can order Noodle Bowl's noodles in soup or non-soup dishes, but I almost always get the same exact thing every time I visit. It's their specialty and you'll be pressed to find something like this anywhere else in the city. #13... Szechuan Beef Noodle with Soup. If you like spicy things, this is the one for you. If you don't like spicy things, don't you worry; they have #15 which is exactly the same, but without the chili. And all of their soups are so affordable! $6.50 for a large bowl of fresh, yummy noodles. 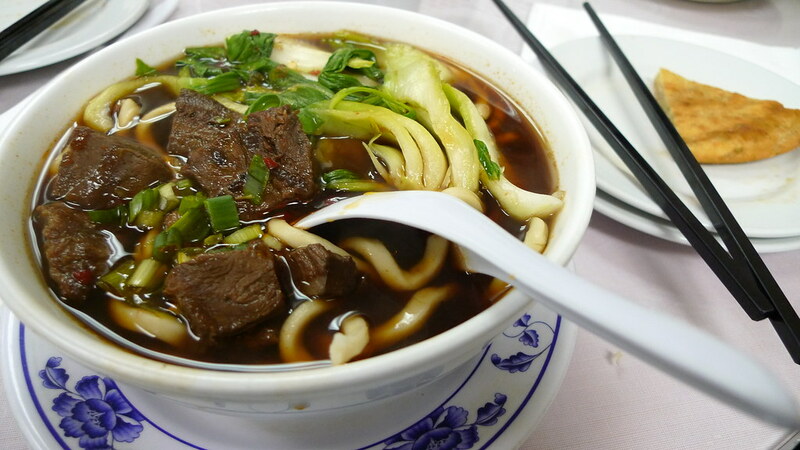 Szechuan Beef Noodle with Soup. This is what I order almost all the time. The Szechuan Beef Noodle Soup is so tasty. I could eat it every single day. The broth has a rich beefy taste and the perfect amount of spiciness to make the meal enjoyable for me. The chunks of beef are poached in the broth and have such an amazing tenderness to them. You can peel the meat off as if it were string cheese. They also add fresh baby bok choy, which I could do without, but compliments the soup well. I finish the entire bowl every time I eat it; not even a drop of soup left. By the time I'm through, my nose is usually drippy and I'm a little bit sweaty. I love it. It's also the perfect remedy for a small cold. When I take Juliana with me here, I will most likely order the non-spicy Brown Beef Noodle with Soup, or #21, Won Ton and Noodle with Soup (the wontons are also made fresh at the restaurant). Both of which she really likes. 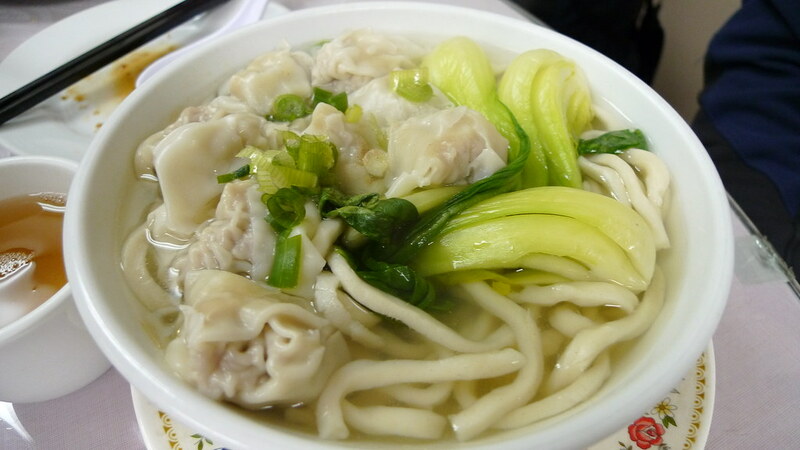 In fact, just recently, she and I shared the Won Ton Noodle bowl together and she was crazy about the broth. She would sip straight out of the small bowl and ask, "More soup, please!" like every five minutes. I hope we can make eating here a tradition. Won Ton and Noodle with Soup. Julie loves this, too. Their wontons are so fresh! have you tried some of seattle's other ramen places? aloha ramen, fu-lin, and all the areas that were listed in ibuki magazine? Thanks for commenting! I have not had a chance to try Mike's yet, but it is now near the top of my list since you recommended it. Do you know if they make all of their food fresh? I think that's why I like Szechuan so much, along with the memories of my grandfather taking me there when I was a kid. The only other ramen place I've tried in Seattle is Samurai Noodle, which I liked. Keep reading and perhaps you'll see more restaurant reviews in the near future.